Samsung has finally got its 31TB SSD into manufacturing, catching up with Toshiba's similarly well-endowed SAS flash package. The 30.72TB PM1643 effectively replaces the current PM1633a and its 15.36TB capacity limit, and is positioned as an enterprise SSD, although Samsung does tell us it can store 5,700 HD movies. News of it first surfaced in August last year, when it was slated to ship in 2017. The device has more than twice the capacity of the largest disk drives, and 24 of these stuffed into a 2U, 24-slot enclosure would produce a 737.3TB, 0.74PB device – impressive, and needing some kind of protection to limit the so-called blast radius if one of the drives failed. Spec-wise the PM1643 uses 512Gbit, 64-layer, TLC (3bits/cell) V-NAND (Samsung's 3D NAND tech) chips. These are stacked in 16 layers to produce 1TB packages, and 32 of these are put inside the SSD to create its 30.72TB capacity. The controller integrates nine previous controllers and has 40GB of DRAM, made from 10 x 4GB DRAM packages, which use Through-Silicon Via (TSV) tech to interconnect 8Gb DDR4 memory chips. This produces an SSD capable of 400,000/50,000 random read/write IOPS – heavily skewed to read performance – and 2.1/1.7GB/sec sequential read/write bandwidth through a 12Gbit/sec SAS interface. Samsung tells us that the PM1643 has nearly twice the performance of its PM1633a, and around four times the random read and three times the sequential read performance of its 850 EVO consumer SSD. So it should, the 850 EVO being a 2015-era drive. Toshiba introduced its 31TB PM5 SSD in August last year, so Samsung, with the PM1643 in manufacturing is now on a par with Toshiba. However, Tosh takes the performance lead, with 3.35/2.72GB/sec sequential read/write bandwidth and a similar up-to-400,000 random read IOPS. Competitors Intel, Micron, Seagate WDC and SK Hynix have nothing at the 30TB SAS SSD capacity level, with Seagate maxing out at 15.36TB with its Nytro 3000. 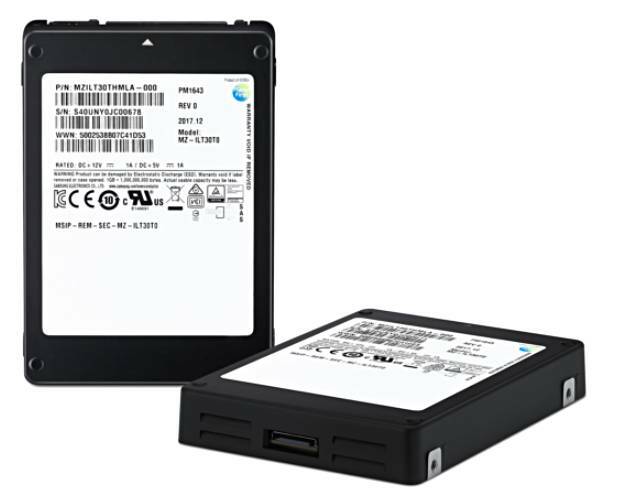 The PM1643 supports a full drive write a day for its five-year warranty period and has a a 2 million hour MTBF rating - nothing exceptional, certainly not compared to Samsung's recent 860 EVO with its boosted endurance of more than two full drive writes a day. Samsung blows its own controller software trumpet, saying the PM1643 "supports metadata protection as well as data retention and recovery from sudden power failures, and an error correction code (ECC) algorithm" but it doesn't mention encryption which might be thought a useful feature. Possibly there is some kind of controller space limitation preventing an encryption chip being installed. If Samsung has to do clever, space-saving things with its stacked 40GB DRAM then the physical space inside the PM1643 is full up and further capacity improvements will come from quad level (4bits/cell or QLC) tech or moving on to 96-layer 3D NAND.